A little while back our pricey Breville coffee machine started leaking water out of the top right hand corner, at the back – somewhere water definitely should NOT be coming out from. So I decided to crack it open and see if I could find the cause. Started by removing the hex screws from the back and the 2 phillips head ones from the bottom to remove the back panel. The top came off by giving it a few solid thumps with my hand on the back (towards the front), then unscrewing the grounding wire. I later found this site that has some notes on disassembly and diagnosis, which I wish I had found before. There’s also a great list of user submitted fixes here on spares.bigwarehouse.com.au. Removing the covers revealed some tubes and wires, as expected. Plugged it in and ran it again to find out where the leak was. Turned out to be squirting out of the top part of the ‘T’ junction you can see on the left in the image below, where the tube goes into that tan coloured plastic connector. That whole section with the black thing is the magnetic valve, apparently. I figured it was a busted o-ring or something and proceeded to unscrew the connectors. Much to my amazement and horror, the top one just snapped with the slightest amount of force – which wasn’t much as I could undo these with my fingers. I guess there was a hairline fracture on that one, which is where the water was squirting out from. What possessed Breville to make these things out of plastic is beyond me. They have hot water and steam going through them under reasonably high pressure. No way plastic was going to survive that. I considered modelling these and 3D printing them, but I don’t think even ABS plastic would have lasted very well – despite melting at 230°C+. Thankfully I was able to get some metal replacements (Part Number: BES820XL/154) from this awesome guy at Eastern Electrical Repairs in Dandenong for only $20 for 2, as I figured the bottom one would blow eventually. Would have been substantially more for him to diagnose and fix the problem though. He kindly threw in some new o-rings to boot. What a nice guy. The alternative was to get spares from here at eReplacmentparts.com, but I didn’t want to wait. There is also a useful parts diagram which would probably apply to both the BES820XL and BES830XL – not sure which one mine is. There’s a more detailed PDF parts diagram for the 800ES, which is pretty similar located here too. The parts for that at spares.bigwarehouse.com.au would probably do the job for any of them. So I now had to figure out how to get that broken bit of thread out, so I could put the metal one in. I unscrewed all the bits of the magnetic valve and removed the plastic bracket that holds it to the side enclosure, before drilling a couple of small holes into what was left of the thread. That let me pop in some tweezers and unscrew it – thankfully it wasn’t too tight. Next was to reassemble it all again. I found it was important to attach the little rubber o-rings to the end of the tubes first, instead of leaving them in the metal connector and trying to push the tube into that. Lovely – all reconnected with a solid metal connector and all new o-rings. That should last a lot longer. Just needed to slide the magnetic valve back on and reconnect the plastic ‘L’ joint and tube. It turned out to be important to make sure the 1 on the brass section of the magnetic valve is on the top so that steam and hot water work properly. With all that done, I plugged it back in and confirmed there were no more leaks. So awesome to be able to make a decent coffee again. Sadly, the steamer was not working and sounded clogged, despite me running through a 50/50 water-vinegar mix to de-scale the machine. I hadn’t done that in ages, despite being instructed to do it every few months. A build up of pressure from that may be what caused the plastic connector to fracture in the first place. Unfortunately, fixing that is a little more involved and is still pending. Oh well – no frothy milk for the moment. Disassembled everything and checked all the tubes, which were all clear. Figured maybe I put something together wrong – so checked my pics from before I pulled stuff apart the first time and it seems I put the brass section of the magnetic switch in upside down. It has a 1 and a 2 marked on it and the 2 needs to go on the bottom – 1 on the top where the wires attach to the top of the black section. After swapping it back around everything works like it did before – steam and hot water coming out where it should. Hooray! Fully functioning machine again. Thanks for taking the time to write this post & upload pictures! I have the BES830XL. Same scenario with mine, the top plastic connector on the magnetic valve assembly just blew/snapped this morning. It’s the first trouble I’ve had with my machine since I got it (lightly used) a little over 2 yrs ago. I think I’m going to go ahead and order 2 connectors (BES820XL/154) and o-rings (BES820XL/140) so I can have an extra one on hand. One of the previous comments had some other links for spares. http://www.ereplacementparts.com/ seems to be a pretty good one and probably based in America, so likely to have better shipping rates for you too. I hope that helps and good luck with it. Let us know if you manage to track one down. Just so anyone after me knows, the new metal connector is out of production! So I spent too much time trying to figure out what the specs were on these babies. I finally pulled the plug and ordered what I thought was the right push to connect fitting and nailed it! So here is the specs and fitting I ordered off of Amazon. Just take off the brass copper fittings from the tips of the hoses trim an eighth inch off and push into new connector! Nice one! Thanks for sharing the product name and how you fitted it. Invaluable information that I am sure will come in handy for others in the future. Thanks for the great post, and information about the push through connectors from Amazon! Sure beats $500 US for a new one. I ordered this part from Amazon, but before I cut the metal fittings off the hose, I wanted to make sure the quick connect fitting continued to work for you? Makes me nervous to cut off the end of the hose, I wish I could find the actual part. I just got one of these and have to troubleshoot it. My machine does nothing and I don’t know where to start. It just makes noise and produces nothing. I either think the piece is missing that pulls the water up through the hose. Or somewhere a filter is blocked.. This is the only place I found online that has inside pics, I know nothing about these machines, any suggestions would be helpful. Hey George, I wish I could help but I’m just an everyday guy who likes to save a bit of coin and isn’t afraid to break something that’s already broken and you’re a bit scant on what you’ve tried already. Have you opened it up and run it with the case off? De-scaled the machine? Did you check out the other sites I linked too to see if there’s similar reports on those? Give those a shot – I found them to be a great source of information. By now you may have sorted the problem however,if you can open the top of your breville,disconnect the outlet from the solenoid (magnetic switch),keep hands clear and turn on brew and confirm you have water pumping from pump outlet. If you have ,then the possible blockage is down stream ,if no water from the pump and it’s trying to work then you will have to prime the pump. Otherwise you will need to check for blockage down stream. When my machine (820) first broke with the same problems, sadly these posts were not here. I remembered that I had some waterproof JB Weld in my boat for emergencies. I stopped the leak by covering the entire fittings with this stuff. It held up for about 8 months. Then it broke again and that’s when thankfully I found all these posts. I thought I was going to have to either purchase an entire new valve or a new machine. I hate the throwaway society that we live in today and knew something had to be out there. Many, many thanks for your postings and to evnglst57 for his recommendations. I was having a hard time finding anyone that had the valves you had mentioned. I ordered from Amazon, as suggested and it took less than 5 minutes to fix it up like new. I cannot say thank you enough. If you lived here in Durham, NC, I’d buy you a beer! Or make you an espresso. I am so thankful for your post. We live quite rural and far from a major city and I was not looking forward to the drive to get my 820 fixed. 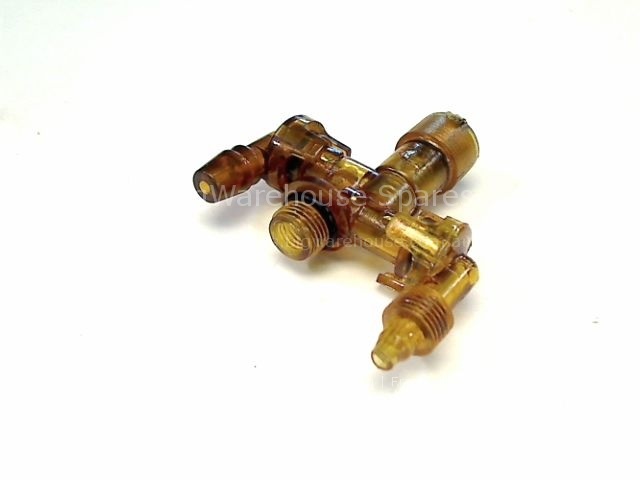 using your post, i contacted a local Breville identified repair business and they are shipping the replacement metal connectors tomorrow. we like being able to fix things here so really wanted to say Big Thanks for the super detailed post!! A question though, after replacing the parts I have water leak from the tube that’s connected to the L shaped piece. It seems like it doesn’t fit completely on the O ring and the pressure makes water to come out where the tube is inserted. O rings are the original but they look fine. Other than replacing them I don;t know what to do. Mine did that too, had to disassemble and reassemble it, carefully applying an even pressure (ie no angle) while insterting the “lock” pin. I made sure the pin was inserted not too far, just like the first picture. No more leaks! Don’t ask me why though. Had the exact same problem, fixed it with two 5/32″ 4mm One Touch M9 connectors, now works like a charm. By the way, no need to drill small holes into the broken plastic connector, just use a flat screwdriver by applying a small force to unscrew it. Always put teflon tape on the new connectors. Hi, I discovered the same with the ‘melted plastic’ inside the magnetic valve. Going to a repair shop and ordered the whole magnetic valve assembly since removing the melted plastic with a screwdriver or drilling is proving cumbersome. Thanks for posting this issue, nice high-res photos! I need to replace the whole magnetic valve but can’t remove the unit without opening the top of my BES820xl. Any suggestion on how to get to and remove the the magnetic valve? Thanks!! Thanks people for your insights into this machine. Mine is slightly different, and so is the problem. I took the machine to Makassar with me when i moved here last year. It is now almost a year new, and the on off switch already does not work. Breville puts a 50cent switch in a $300 machine and i needed your instructions to dismantle it, so this blog has been very helpful. In this warm climate, turns out the plastic button in the switch has melted, leaving it inoperable. I was wondering why it was worse when the machine had been in for a while. I’ll now scrap the plastic bit of the switch and leave a part of a wooden skewer to close the circuit. Best solution away from Eastern Electrical Repairs who i am sure would have a better one. I cant believe breville would put such crap components in these things. Poor design specs and i will be wary of their products in future. Most people would turf it, but that is not an option here. Too soon. The switch still does not work. Next step: remove it, short the wires and use an external switch. Any advice? Sorry to hear your previous attempt to fix the switch didn’t work. I’m having trouble picturing the switch you are referring to and I’m guessing it’s not a simple matter of soldering in some 3rd party on/off switch to do the job. Hopefully one of our talented readers will be of more assistance than me. Good luck. I hope you get to the bottom of it. I have the Breville espresso machine 800 series for about four years with no particular issues. A few days ago a turned it on and heard a irritating sound with no pumping water from the tank nevertheless a pumping sound as use to hear. I opened the back panel and everything looks in place. No leaks and no broken parts. I have the feeling that the pump doesn’t function as I turned the machine on and touch the pump and fault to feel any vibration or sound of action. Will appreciate if you have any idea that may focus me on the real problem. Sorry to say I don’t know enough about the machines to help with that. Maybe see if there’s anything on http://siber-sonic.com/appliance/breville.html that sounds like your issue. Good luck, I hope you can find a fix that’s not to costly. Thanks for your prompt reply. Willl do that. I have the same problem as everyone here it seems. So, if I use the 5/32″ 4mm One Touch M9 Male Thread Pneumatic Straight Quick Fittings to fix it, do I also need to put on a rubber O ring? Second question, I cannot get the male part out and I am concerned about damaging the thread. Any ideas? Thanks a bunch for sharing. I have a Cuisinart EM-200, with the same issue, and same crappy plastic connectors you pictured. I have looked far and wide hoping for a solution. I will be purchasing the “5/32″ 4mm One Touch M9” via amazon. $5.09 each. Thanks again for taking the time to detail your fixes all. Mine is also a Cuisinart EM-200. Have you fixed yours successfully? Thanks for sharing your knoledge and experience. I just replaced the two plastic connectors (using old “O”-rings) with the new Breville metal connectors ($ 7.99 ea.) and worked perfectly. I’m having a decent espresso finally…. My BES860 is leaking water through cracks in an elbow connector. The connector joins the tubing from thermoblock to steamer solenoid valve. Breville repairers said they could only order the whole solenoid valves assembly as spare which costs $120 to $140. With this poor spare parts support, there is no point in buying this local brand product. Does anyone have another source for the BES830XL/154 part? The Amazon one listed above isn’t the exact thing. Thanks! Thanks The BFG for the post. I’m in the middle of trying to fix my BES830XL, first I got water leak a month ago, yesterday it stop making espresso but the hot water dispenser and steam/frother seems working fine. After I finally open the machine, to my horror the black piece thingy of the magnetic valve assembly MELTED. Long story short bought the part and they seems to have the metal connector, will see how it goes…. thanks for the tips. We had a leaking boiler and found that the small circular seal needed replacing so used an o ring from the plumbing section. It worked a treat. I think a larger o ring would also work for the rectangular seal as well with a little manipulating. Can anyone explain how to remove the BES860XL/02.22 Diffuser Assembly? I started to notice water collecting and leaking from the bottom of the unit. I was able to open and run the water with the top off and the water was coming from the bottom of the diffuser. Upon looking closer, the diffuser has a crack on the bottom left corner and water is starting to leak out. I’m planning on using a food grade sealant as an interim but would like to swap this out in the future. Check out the links to Siber Sonic and Big Warehouse. The first has some good directions on disassembling things and (if I remember correctly) the second has some good parts diagrams, which should help with disassembly. Thanks for the write up! My solenoid valve started started stuttering after some 5 solid years of solid use. More recently a leak developed form what turned out to the same connector as yours. I ended up replacing the entire valve, which lucky for me, came with metal connectors. No sweat, so glad you got it back up and running. Here’s to another 5 years reliable service! I need to purchase a solenoid valve for my Breville. Where did oyu purchase yours? where can i get a good spread out view of all parts and locations diagram ? Funny you should ask, I have recently upgraded to exactly the same machine. The main board in the old one crapped out and I found the 860 on eBay for the same price as a replacement board, so upgraded. A quick search on BigWarehouse brought up this exploded parts diagram. I hope that helps you track own what you need. Looks like they have a bunch of parts for that model too. Thanks for the link. I need to replace some buttons and dials on the front panel. For the life of me I can’t figure out how to get the front panel off without gutting the whole machine. It seems like there are two screws securing it at either side just under the top cover but removing them does not do the trick. It seems as if there must be something else, more inaccessible, holding the panel in place but not even the exploded view shows it. Has anyone else attempted this on the 860? Is there any benevolent soul who could offer a pointer before I gut my machine trying to get it off? Firstly, great write up and links to useful sites. I’m having a issues with my BES820 and I was hoping you could confirm for me what part I need to replace. When I run the steam wand I am also getting steam and some water coming out of the brew head. What do i need to replace to fix this issue? Im having the exact same problem, except it seems to have been leaking for a while and shorted something out. When I plug it into a GFI outlet it trips it instantly. Still works on a regular outlet though. Just found all this out today, thanks for the great info. Getting to work now! This is such an awesome thread! My 820 just let go in that same way. After searching around for parts forever, I came across this. Just ordered the generic part from Amazon. Apparently going to take 2-4 weeks to come in. Couldn’t force myself to pay $29.99 for shipping $7 worth of parts!